The Cathedral Church of St George is a Greek Orthodox church in Istanbul. Since about 1600 it has been the seat of the Ecumenical Patriarchate of Constantinople, the senior patriarchate of the Greek Orthodox Church, and of the Ecumenical Patriarch, recognised as the spiritual leader of the world's Eastern Orthodox Christians. The church is located in the Fener (more traditionally Phanar) (Lighthouse) district of Istanbul, north-west of the historic centre of old Constantinople. It is a relatively small church, particularly given its status in world Christianity. The church is open to the public from 8.30am to 4pm, but strict security screening is in place. It is visited by a stream of pilgrims from Greece and other Orthodox countries. Behind the church are the offices of the Patriarchate and the Patriarchate Library. The Church, which was part of a convent or monastery before becoming the seat of the Patriarch, is outwardly unimpressive, but its interior is lavishly decorated in the style much loved by Orthodox Christians. 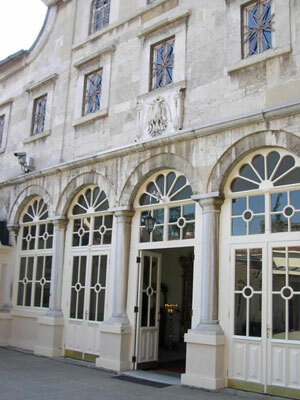 The Patriarch Matthew II (1596-1603) moved the Patriarchate to the former convent of St George in the Phanar in about 1600. The city had been in the hands of the Ottoman Turks since 1453 and its population was largely Muslim. The Phanar district became the recognised centre of Greek Christian life in the city. The church has been reconstructed many times and little remains of its original structure. The Patriarch Timothy II (1612-1620) rebuilt and enlarged the church in 1614. It was again reconstructed under Patriarch Callinicus II the Acarnan (1694-1702). In the early 18th century (sources vary on the exact date) the church was badly damaged by fire. In 1720 Patriarch Jeremias III (1716-1726, 1732-1733), wrote to Neophytos, Metropolitan of Arta: "By the mercy and will of the All-Good God, the lords, may God grant them long life, were moved and they gave us permission to rebuild from the very foundations the holy church of our Patriarchal and Ecumenical Throne, and so we have started this building with the help of God." The restoration works of Jeremias III were continued by Patriarch Paisius II (Patriarch several times between 1726 and 1752). There was another great fire in 1738, when the church again suffered severe damage. It was not until 1797 that Patriarch Gregory V was able to begin large-scale restoration work. The current state of the church largely dates from this rebuilding. The church has the plan of a three-aisled basilica with three semicircular apses on the east side and a transverse narthex on the west. The interior is divided into three aisles by colonnades, with the tall pews of ebony wood placed along the line of the columns. This arrangement leaves ample space in the nave for the performance of the liturgy. In the holy bema, behind the altar, the synthronon is arranged in a semicircle along the curved wall of the apse, with seats for the Archpriests and a central higher throne of marble for the Patriarch. Further changes were made to the church under Patriarch Gregory VI (1835-1840), when the roof was raised to its present height. From this restoration dates the neo-Classical marble doorway with the ornamental door-frames, which makes the front exterior of the church look rather unlike most other Orthodox churches, which are usually designed in the Byzantine style. The last major rebuilding was carried out by the Patriarch Joachim III (1878-1912). The marble pavement of the sanctuary was replaced, the synthronon was renovated, marble caskets were made for the depositing of the holy relics, the icon-frames were repaired and the ecclesiastical collection was enriched with liturgical vessels and vestments, all donated by Orthodox Christians, mostly from outside the Ottoman Empire. The church was again damaged by a fire in 1941 and for political reasons it was not fully restored until 1991. Its most precious objects, saved from each successive fire, are the patriarchal throne, which is believed to date from the 5th century, some rare mosaic icons and relics of Saints Gregory the Theologian and John Chrysostom. Some of the bones of these two saints, which were looted from Constantinople by the Fourth Crusade in 1204, were returned to the Church of St George by Pope John Paul II in 2004. Since the fall of the Ottomans and the rise of modern Turkish nationalism most of the Greek Orthodox population of Istanbul has emigrated, leaving the Patriarch in the anomalous position of a leader without a flock, at least locally. Today the Church of St George serves mainly as the symbolic centre of the Ecumenical Patriarchate, and as a centre of pilgrimage for Orthodox Christians. The church is financially supported by donations from Orthodox communities in other countries. On December 3, 1997, a bomb attack seriously injured a deacon and damaged the Patriarchal Cathedral. This was one of the many terrorist attacks against the Ecumenical Patriarchate, its churches and cemeteries in Istanbul in recent years, which were condemned by the Turkish people, and the efforts to bring the terrorists into justice are continuing by the Turkish officials.